Reel Talk Online: Why Does SICARIO Keep Getting Snubbed by the Major Awards? Why Does SICARIO Keep Getting Snubbed by the Major Awards? I meant to write about Sicario earlier, but I guess I was too busy drowning in the mediocrity of too many other films last year. By now, many of you probably already know that Sicario is absolutely brilliant. The cinematography (shout out to the great Roger Deakins), the acting (literally, every cast member adds such a terrific element to the narrative), and Taylor Sheridan's screenplay--all led by director Denis Villeneuve--make for a brilliant film. So, why is it getting shut out of many of the major awards? (Though the recent British Academy Film Awards nominations threw Benicio del Toro a bone, nominating him in the supporting actor comedy--the film's only nomination. Neither the Screen Actors Guild nor the Golden Globe Awards even bothered). What's more mind-boggling is that garbage films like The Big Short are recognized consistently. I'm over it. I hope it's not just another case of voters' allergy toward genre films, because eff that. The hugely problematic sci-fi drama, Ex-Machina, can't hold it down for this entire set. And I refuse to go through another award season of costume dramas, meaningless comedies and boring narratives (I'm looking at you, Brooklyn). 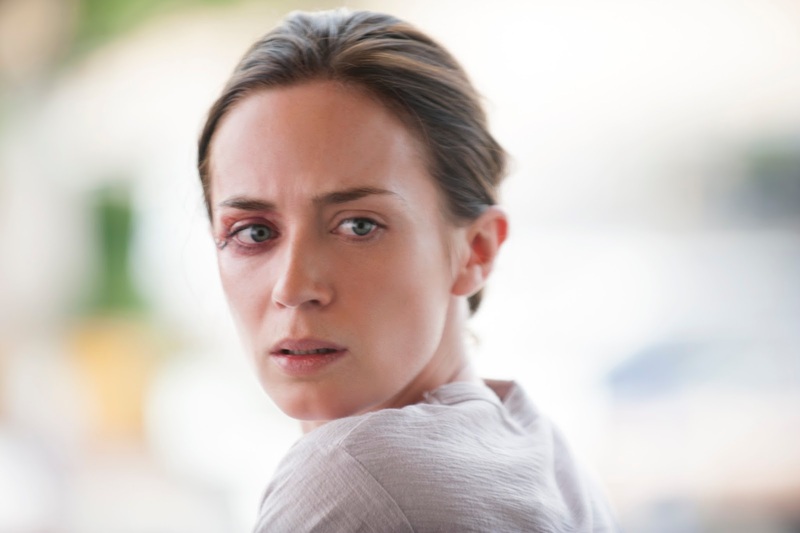 Plus, in this constant dialogue about 2015 being the "year of the woman," why is Emily Blunt's performance in Sicario get left out of the conversation? It is easily one of the best female performances this year, and the heartbeat of a fantastic film. So where are her nominations? Her portrayal of an FBI thrust in the middle of a highly dangerous Mexican cartel investigation is multi-layered, nuanced and engrossing. You feel her fear, her determination to believe in what's right, and ultimately her jadedness. That's more than I can say for many other performances, male or female, from last year. And let's get back to the look of Sicario for a moment. Deakins places the audience at the center of the action--from the back seat of a military vehicle at a holdup at the border area between the U.S. and Mexico, and through the night vision goggles of a top secret government task force ready to bust down every door within a 50-mile radius. So, I need answers. Why isn't this film getting more love? I blame marketing. The trailers for Sicario didn't look that interesting. I wasn't even going to see it until people started raving about it. It's so much more than what the trailers lead on. I really hope it gets some Oscar love. Deakins especially, this is still the best shot film of the year, IMO. I kind of agree with Brittani above. BUT, maybe the Oscars will surprise us??? As a professional critic, I am guilty of heaping excess praise on reigning A-listers like Jennifer Lawrence, et. al. But lately I've found more artistic sustenance from those outside what Hollywood would consider "the box". Emily Blunt is a character actress who takes on a role in "Sicario" that requires intelligence and balance. Everyone (in 2015) expects the badass woman in tight-fitting clothes to barrel in with guns blazing and prove that political correctness is valid. That is not, thankfully, what Emily Blunt gives us. She gives us something closer to a human with realistic reactions to a traumatic environment, scraping together enough dignity to fight a one-sided battle. And that is a character worth investing in. THAT is why she's near the top of my Best Actress list this year, but not many others share that view because they look at the short-term "who's hot and glamorous right now, who's the highest-paid or the most-marketable". Oscars and such are like that. If acting skill had value to the Academy last year, Rosamund Pike would've won. You are right about Emily Blunt. Has anyone ever seen such a helpless and vulnerable character on the silver screen before? I think you're right about the attitudes towards genre flicks. Many critics are strangely condescending towards certain well-trodden themes while permissive towards others. Maybe they just appreciate a plot when the ideology is clear. But I loved Sicario in the same way I loved Fincher's Zodiac. Never holding your hand or telling you how to think. Both murky and ambiguous but both extremely effective at portraying real people in dark situations. Very simple answer. It's to real and breaks the safe space bubble liberals live in. Portraying the savagery of the cartels in some border towns and few miles in is a big no no. Americans are not supposed to know the cartels are miles worst than even ISIS, beheading, dismembering, flaying and putting them on display is a daily thing.